Basaltic formations, groups of fish and many algae are the highlights of diving at La Vieja, meaning the Old. 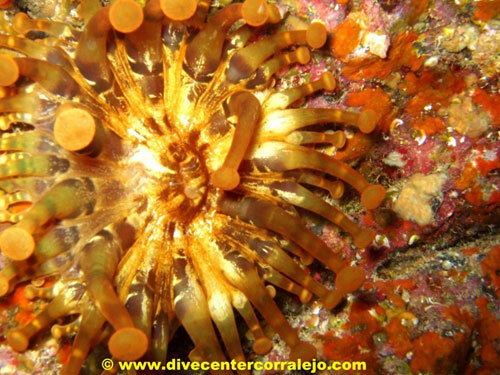 La Vieja is a dive site with a great area to be explored. It is of interest due to its basaltic formation and is one of the most protected reefs in the area. It is a calm dive with hardly any currents and many passageways and canyons. The maximum depth is 10 meters. The edge of the reef has shoals of fish (many Parrot Fish) and the reef itself is covered with many varieties of algae. Sting Rays can be frequently found here, as well as different types of Bream, Barracuda, some Canarian Lobster, Octopus, Moray Eels, Brown File Fish, Scorpion Fish, Guelly Jacks, Triggerfish, Glass Eyes and Cardinal Fish, Great Tiger Fish and Scribbled Filefish. Again highly recommended for all levels of divers, this area is not very deep, and depending on the route taken, it can be either a simple dive or a more complicated one.